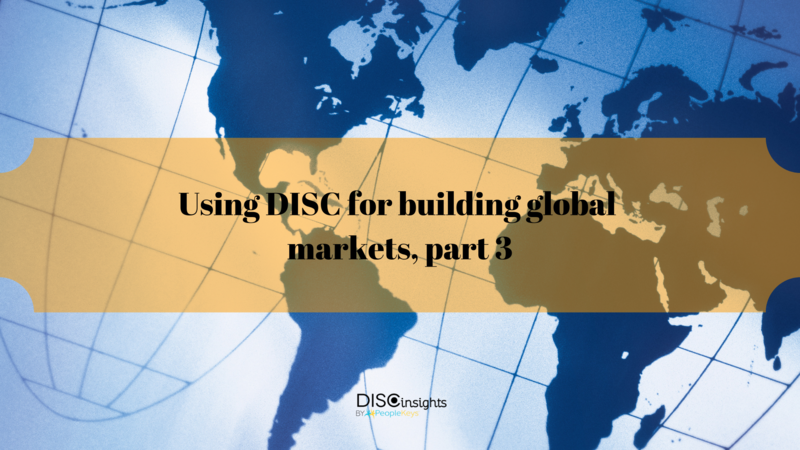 Continuing our series on global expansion by utilizing DISC, we already reviewed the importance of DISC for strategic planning and applying behavioral analysis for hiring and teambuilding in part 1, and focused on some strengths of the different personality styles for business development in part 2. In addition, we must understand that some countries are more family-oriented than others. These cultures may be friendlier, ambitious and centered on people. Other cultures can be more impersonal – especially in business. They want to know numbers, there is very little eye contact and they can be somewhat aggressive. Short and to-the-point, we need someone to present them with the facts, while onboarding them for ongoing business initiatives. In addition, see also How do DISC styles vary by country. We must understand the local laws, traditions, regulations, and compliances. Creating an effective team in each new territory is only half of the journey. We must consider local societies and traditions to not offend those, who were born and raised in each region. We want to be accepted, although a foreigner in their land. We want to keep our teams happy and make sure that they are satisfied in their new positions, that we continually improve employee relations and retention. This definitely means adjusting our workstyles in effort to satisfy local traditions, holidays and standard hours of operation. See how to harness the hidden passions of your millennial employees. Our business should operate according to local laws and regulations. We must do our due-diligence to not only understand how something is done but why this is important. Having team members, who are accustomed to these laws, we are more likely to succeed and less likely to “tick off” local authorities, while we operate. They can speak on our behalf and minimize bias faced, as we become established within the community and prove ourselves worthy, nonetheless. Through their expertise, we can learn the ins and outs of local regulations and strengthen our business over time. Pace, Time Schedules and Demand. When working in new territories, we will encounter differences in how the days are scheduled. In some countries, employers are expected to allow for longer break times, often allowing staff members to go home for dinner and a nap. A major part of their culture and tradition, it also seems to keep teams more productive and alert, is promoting safety and increased effectiveness within the workplace. In other countries, work is slower-paced, and yet the quality is amazing. Being more laid back allows for an increased focus on the details without the feeling of being overwhelmed, stressed or rushed to meet short-term deadlines with lower quality results. These may not be normal practices in the United States, but should be considered when doing business within a foreign territory. Will our branch locations, focus on family and allow intermittent breaks so that employees can run errands during business hours? What steps do we take in corrective action, and how do we communicate standards? We must realize, not every leader is the same. Why slang, perception, and use of language is of key importance. I’m sure you have heard of landmark cases, such as when Ford failed with their launch of the Pinto in Brazil. “Pinto” in the United States may sound innocent enough, and in other countries, it may translate to a type of bean. However, once Ford introduced the Pinto to Brazil, they would quickly learn that this word was also slang for a part of the male anatomy, losing drastic market share in a country that took great offense. It was an insult to their culture, and something of a disgrace. When the ADA launched the “Got Milk” campaign in Latin America, a similar response effectively took place, as this literally ended up translating to “Are you lactating?” In either of these cases, each brand would have otherwise succeeded had a “C” type personality been in charge of research. Not only did each brand lose all marketing dollars that were sunk into each campaign, but they also lost market share, trust, and probably respect. Not only was this embarrassing to each brand, but relaunch didn’t prove any better with not-so-distant memories haunting them for years to come. In conclusion, utilizing DISC will provide us with a better understanding of people. Observing business within each culture will help us to better understand and optimize the workforce. Using what we already know about DISC-type personalities will allow us to better position that workforce and engage in improved technique. We can mold and optimize our workforce, and we can better meet the needs of our consumers.